I finally felt it was time to sit down and write out Carleigh's birth story (and the days after) before the memories start to fade and I forget all the little details. Carleigh's induction was set for 7:30 am on Friday morning, March 27, 2009 at Clinton Memorial Hospital in Wilmington, OH. I woke up at 5:30 am that day so we would have time to get everything around without rushing. My parents came down the night before and that was very helpful. I finished packing our hospital bag while my mom attended to Kyndra. I made sure I ate my fill for breakfast because I knew I wouldn't be able to eat anything until I delivered Carleigh. So I made 3 blueberry waffles and ended up eating almost 2 of them. I also had a tall glass of ice cold milk. We got everything around and left our house at about 6:45 am to head to the hospital. I felt pretty calm on the ride there. I had been through an induction before with Kyndra so there was no reason to feel nervous about that part of it. Carleigh was already up for the day at this point and was moving and kicking and she already had a round of hiccups. We got to the hospital at about 7:15 am. I stopped by the registration desk to make sure I didn't have to register there since the hospital had done away with the preregister forms. They said I was ok to go straight up so we went to the elevator and went up to Mother Baby Care. We check in with the nurses and they take me to my room, which is right next to the nurse's station. The door to my room already had a Do Not Disturb sign and a sign indicating bereavement, which I had requested in our birth plan. My nurse, Monica, showed me my gown and the lovely cup I got to pee in. So I dressed in my labor uniform and peed in the cup. Anthony's family arrived at the hospital and came to my room. Pastor Mike from my mom and dad's church also made an appearance, which was very nice, and Pastor Mark from our church was there. After some visiting we had family leave the room while Monica got my IV set and blood drawn. She got some saline running and then hooked me up to the monitor. She asked if I wanted to monitor Carleigh's heart rate and I said I wanted to at the moment. We also got some paperwork filled out, such as consent forms and birth certificate information. My cervix was checked and I was at 1 cm and my cervix was in a good position. At about 8:15 am Monica got my Pitocin running. Around 9:00 am I was feeling the contractions but they weren't bad at all-just a little uncomfortable. I was still able to be my normally pleasant self for awhile. 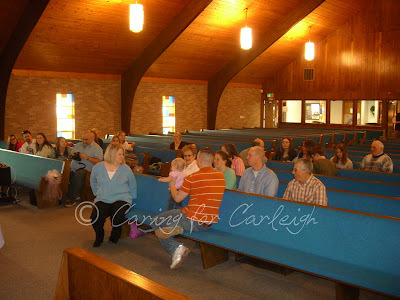 We had our family and friends come back in and Pastor Mark prayed. The cafeteria made homemade banana and blueberry muffins and brought drinks for our families, which was very nice! Close to 10:30 Monica backed down my Pitocin because I was having quite a few contractions close together but they weren't really bothering me. After things settled down she bumped my Pitocin back up and things continued steadily. At this point more of our family arrived for us. I was glad there was lots of people there supporting us. It helped to have them looking out for Kyndra because she couldn't really be in the room with me for very long. Kyndra had been very clingy to me for several days and being in the room for a long period of time just upset her because she couldn't be near me. When she was near she kept trying to pull at my IV and things she wasn't supposed to. During her midmorning nap though I was able to hold her and I really liked that. I don't like being away from my little girl for very long. I got some flowers from my friend Rachel and my former coworker Cathie. They made my room smell good and they were pretty. Throughout the whole labor our family and friends came in and out of my room visiting me and checking on how things were going. Around lunch Monica let me have a cherry popsicle. I was so grateful for that darn popsicle. It tasted so good and I was hungry! It satisfied me for a least a little bit. My Pitocin was being bumped up every so often and the contractions were steady but still not too bad. I was able to get up and move around as I pleased. I browsed the internet and updated the blog every so often and I also read the end of the last book of Twilight to pass the time. I stayed hooked up to the contraction monitor the whole time besides when I used the restroom and when I walked the hallway later. Not long after 3 pm I had Monica hook me back up to the heart monitor but it was only for a little bit because Carleigh was moving around so much. Dr. F finally came by and checked on me. She checked my heart and lungs and then Carleigh's position on ultrasound to make sure she was in a favorable position for labor and she was head down and good! She didn't check my cervix because she didn't believe the contractions were hard or strong enough to really make any difference. So Monica just kept bumping up my Pitocin steadily. Around 5 pm I decided to walk the hallways so I ok'd it with Monica and I was off! 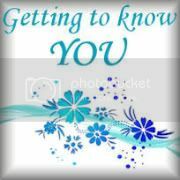 I went through 3 walking partners-my sister, my mother-in-law, and my pastor. It was nice to get up and move around for a bit. I didn't really feel much contractions while walking but I did feel some pressure down there. I did quite a few laps in the hallways. About 7 pm Dr. F came and check on me again. This time she checked my cervix and I was still at 1 cm and I was 60% effaced. So throughout the whole day all my cervix did was thin a little. That was quite frustrating. We were getting to the point where the Pitocin would only run for a few more hours and then we'd have to shut it off and start it back up again the next day. I really didn't like the idea of having to stretch out labor over several days. I just didn't feel like it would be good for Carleigh. Dr. F let me know that the other option would be to break my water but she knew I really didn't want to have to do that. 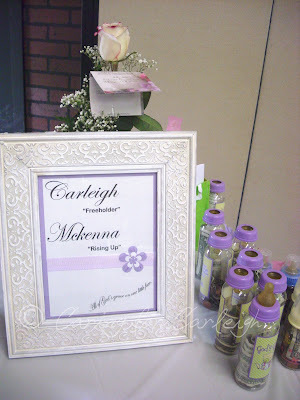 In the birth plan I had wanted to keep my water intact to help protect Carleigh's head during delivery. It was a hard decision to make and I struggled to decide what would be best for my daughter. In the end I chose for Dr. F to break my water. When she broke my water it was more comfortable than when I had it done with Kyndra. There was a lot of fluid that came out-more than what I thought was in there! I soaked through 2 chux and a large towel. Monica's shift ended at 7:30 pm and my next nurse was Erin. Right after Erin came I got another cherry popsicle, which was good! My contractions started to pick up with more intensity since my water was broken. I could still feel Carleigh moving around good in my tummy but it was weird feeling her moving in there with not a lot of fluid. Erin came in around 8 pm and brought me a quilt. 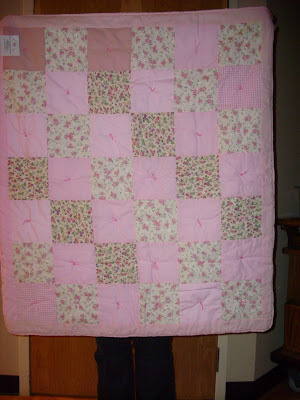 The quilt was made by a volunteer and donated to the Mother Baby unit for them to give to a mommy and her baby. I guess they decided to give it to me. It is very pretty and I appreciated that they thought to give it to me. By this point the contractions started to get a little more painful but still tolerable. Around 9 pm Dr. F stopped in for another visit. My cervix was 2-3 cm and I was 80% effaced so I was making progress, but not as quickly as I would've liked. She checked her position of the ultrasound machine again and she was still good. Contractions continued to get more uncomfortable and I was pretty sure at this point I would end up with an epidural. I knew how it helped relax me and made me dilate quicker with Kyndra so I just needed to decide when I wanted it. By 10 pm I was sure it was time for the epidural so the anesthesiologist was called. I was dilated to 3 cm. Dr. G was my anesthesiologist and she did a good job putting it in. She had me sit on the edge of the bed and Anthony was in front of me. My epidural with Kyndra I was lying down while it was put in. She kept the atmosphere light and cheery and that was helpful. The epidural worked pretty much right away but not long after it was in I started feel nauseous and my BP got a little low. I ended up throwing up and it was pretty much just spit because I had nothing in me. I did feel better after that though. I decided to rest as much as possible before the delivery so I slept for a little bit. As time passed I noticed that my epidural was concentrated more on my left side. I couldn't feel a darn thing on that side but I could feel the contractions on my right side and move that leg around just fine too. Every time I had to move to change the pad underneath me it made me laugh because my left leg was just dead and it flopped around. It was funny to see. By this point it is 2 am and I got some ice chips for my dry throat. All of our family was out in the various waiting rooms either sleeping or just sitting around waiting. Anthony and Ashley, my friend and photographer, were sleeping in my room. I had thought that some of our crew was going to go home but everyone decided to stay and stick it out. Erin had brought me a handheld doppler earlier so I could check Carleigh's heart rate whenever I wanted. I didn't feel Carleigh kicking around as much and that worried me so I checked her heart rate on the doppler and it took me awhile to find it. It had me frantic when I couldn't find it. I remember thinking in my mind "oh please, please, please be ok little Carleigh." I wave of relief washed over me when I finally found it. It was faint on the doppler but it was there. Later I had Erin check it when I was worried and she found it and it was in the 140's. The contractions kept getting more intense and I started to have to concentrate a little on my breathing to help with them. Of course, I could only feel them on my right side. By 3:30 am the contractions were pretty intense and Dr. F was back to check on me. I was starting to feel quite a bit of pressure down there and I let them know. She checked my cervix and said I was ready to push. I couldn't believe it! The time had arrived for the birth of my daughter. I was scared, nervous, excited.....so many emotions at once. I had Anthony call Lindsey, who was at her mom's house waiting for our call, so she could get to the hospital to videotape Carleigh as soon as she was out. The room was a flurry of activity. Erin, another nurse, and Dr. F were getting things ready for the actual delivery and afterward. I got in position at the end of my bed and Anthony came to my side. Ashley got her camera ready and got into position to take pictures. I started pushing when the next contraction came. I got in about 3 pushes per contraction. I only had to go through several rounds of pushing and Carleigh's head was out. Dr. F suctioned her mouth and nose and then I continued with more pushes until she was completely out. It was 3:49 am. Dr. F clamped her cord and Anthony cut it. Carleigh was immediately laid on my chest. She was so beautiful. I looked at her for only a few moments and I knew she was gone. Erin listened for her heartbeat with a little stethoscope but could not find any. My daughter was born still. All I could do was stare at this precious baby I had just given birth to. She was mine. I had wanted so badly for her to be born alive and to be able to spend some time with her but at that moment it didn't matter. Regardless if she was alive or her spirit was already in Heaven, she was in my arms and that's all I cared about. After so many months of waiting for her she was here. 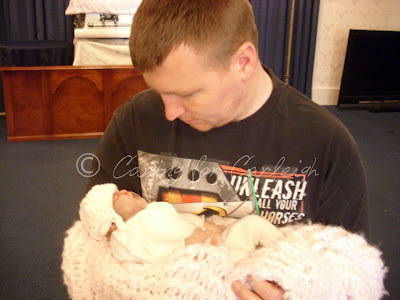 Beside me, Anthony was crying for our daughter. I just gazed into her beautiful face, which looked much like Kyndra. I caressed her tiny fingers and toes. I just took it all in. I noticed her bruises from being born and I wished that they weren't there. I prayed that she passed before delivery and didn't have to suffer. 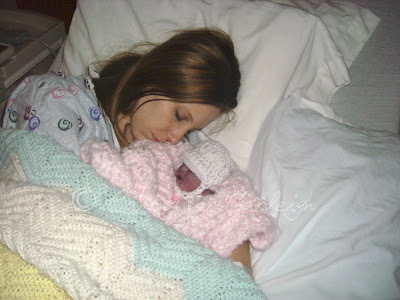 Right after Carleigh was born Lindsey arrived and immediately started videotaping. Ashley was already taking lots of pictures. It was about 45 minutes later that we let our parents come in to meet Carleigh. Anthony had went out to tell them that Carleigh had been born but that she didn't make it. Many of them took it hard. 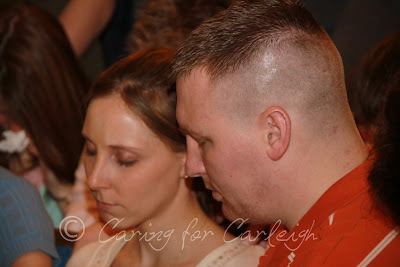 Emotions ran very high that evening as we both rejoiced for Carleigh's birth and mourned for her passing. Eventually we let everyone else come back. 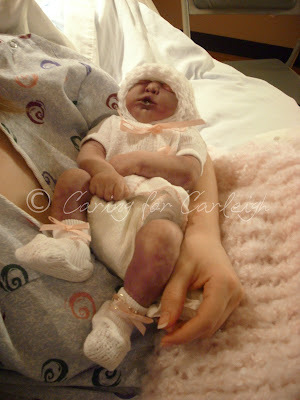 I had Erin weigh Carleigh and she was 3 lbs and 15 oz. A small little bundle of joy! After holding her a little longer I let Erin give her a bath. Carleigh stayed in the room while she did it and we all watched. Erin was very careful and gentle with her. After her bath she came back to me and I dressed her in her hospital outfit. It fit her so perfectly except for the hat, which was too big but I wasn't surprised. I had a tiny white crochet hat with ties that fit her just perfectly. That hat pretty much stayed on her the whole time. I had a tiny pink bracelet to put on her but it was too big for her little wrist so I put her gold ring, which was too big for her, on the bracelet and put it on her left ankle. It fit better there. She was such an angel in her little white and pink outfit. I let all of our family and friends hold her while I ate a turkey sandwich and drank a 7UP. I was quite hungry and thirsty. I am sure it meant a lot for them to be able to spend some time with her. I didn't want anyone to miss out on that experience. We got some imprints of Carleigh's hands and her feet in clay. 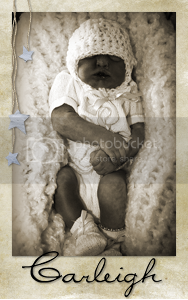 Then we got her hand and footprints in her baby book with pink ink and on the back of a few bassinet cards. Her hands were difficult to do because her fingers were starting to curl but we managed. I had Erin measure her and she was 13 1/2 inches long. Her head was 9 inches, her chest was 10 1/2 inches, and her abdomen was 10 inches. Eventually our crew filtered out of the hospital and back to wherever they were staying and Anthony and I were alone with our daughter. Once I was able to walk we went to our postpartum room with Carleigh. We got ready for bed and went to sleep. It was really the morning but we were quite exhausted from the long day and night behind us. Anthony was on the chair/bed in the room and Carleigh and I snuggled up in my bed. The next day our family came back to the hospital to see us and we all just spent time with Carleigh. I had my mom and dad bring donuts for the nurses for being so nice to us. I made sure they brought me some donuts too. I changed the dressing on her head and my nurse, Michaella, helped me to get some locks of hair for us to keep. She actually had quite a bit of hair on her! The days in the hospital passed by so quickly. I really don't know where the time went. Before I knew it our last day arrived. Dr. F gave us the go ahead to be discharged after she checked me over. We went over last minute papers and made arrangements to take Carleigh to Fisher & Edgington funeral home. I changed Carleigh's outfit to an all white one that had pants and a long-sleeved shirt. I didn't have any socks so I left the little booties on her. It was very emotional changing her clothes. I knew time was drawing near where I wouldn't be able to have her in my arms anymore and I honestly wasn't ready for that. So I dressed her with tears in my eyes and then I held her so very close to my heart. All of our stuff was ready to go. Michaella brought a cart and we loaded up and she escorted us out. It felt like a walk down death row, not that I have ever experienced that but that's all I can think of to compare it to. We got to the main entrance of the hospital and Anthony and my dad went and got the cars and loaded things up. I stayed inside with Carleigh because it was a little chilly and rainy outside and I didn't want her out in that. It was just me and Michaella inside now and we hugged and cried and said goodbye. I walked Carleigh out to the van. I made sure she was covered up good with her fuzzy pink blanket. We made the too short drive to the funeral home and went inside. Craig, one of the funeral directors, was waiting for us. Anthony and I sat on the couch with Carleigh and spent our last few minutes with her. We hugged and kissed her and just stared at our precious daughter. Then I got up and I handed her over to Craig and gave her one last kiss. Honestly, that was the hardest thing I've ever had to do. It broke me. Anthony held me and I just sobbed. I couldn't catch my breath. He kept his arm around me as we went out to our van. We made the long drive home without our daughter. At that moment I never felt more empty before in all my life. I missed having her in my arms and it had only been a few minutes since she had left them. At home I could only look forward in anticipation to the next day when I could see my daughter again, even though it would be to dress her in her burial outfit. Some days are more of a struggle than others, but every day I miss her. I am so glad I had this journey with Carleigh and that she is my daughter. She is so very special me and a blessing straight from God. Thank you, Lord, for sending her to me. I had a follow-up appointment today at the Mother Baby Care unit where I delivered Carleigh so my mom drove me there this afternoon. Renee, who is the lactation consultant, did my visit with me. She went over a list of things to make sure I was healing and feeling well (both physically and emotionally) and she also took my BP. 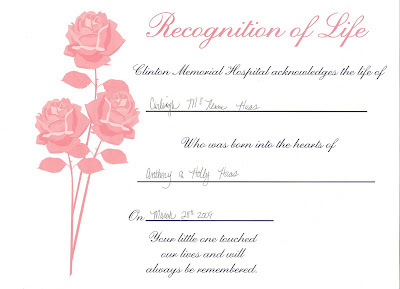 She gave me a certificate of life for Carleigh and also a little note of sympathy from the nurses who took care of me during my stay. 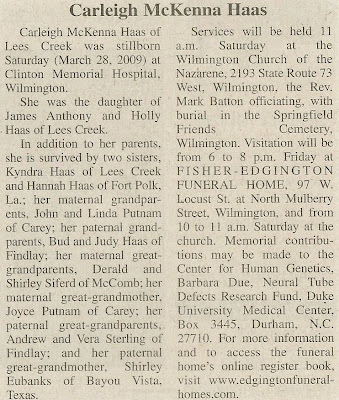 Today Carleigh's obituary ran in several papers. I have the one out of Wilmington's paper thanks to Lindsey. She picked me up one while I was at the hospital for my visit. Today I have been busy sorting through and editing pictures, scanning various things onto the computer, completing Carleigh's baby book, and preparing her scrapbook. It's a lot of work! I've made a small dent in what needs to be done and I'll be working on everything more tomorrow. Carleigh's baby book is as completed as I can get it for now and now it is time to start on her scrapbook, which will take a lot of time. I've already got some pictures printed out and I plan on printing out some more this evening to prepare. Tomorrow evening Anthony and I will be going over to Lindsey and Jarrod's house to take the pictures over for Carleigh's slideshow. Jarrod is putting together one for her service on Saturday. I know it will be so amazing and I have no doubt it will make me cry. I also need to call Dr. F's office and schedule a 2 week and 6 week follow-up with her. I got an email from Heidi at Duke saying that they got the blood samples from me and Anthony and also Carleigh's cord blood. She also said she got the pictures of Carleigh's head I sent her. They have started chromosome analysis on Carleigh's blood and she will call us when they have the results, which will be approximately 4 weeks. Today my milk finally came in and my breasts started to get a little engorged so I decided it was time to start pumping. Originally my plan was to pump and store up enough milk to donate but lately I have been thinking of just pumping it and giving it to Kyndra if she will drink it. I was able to pump 5 oz today. I haven't given her any yet but tomorrow I will give it a try. She won't drink regular milk out of her sippy cup so maybe she will drink my breast milk. If Kyndra won't take it then I will donate it. I'm not sure how long I will pump but I know I will slowly try to reduce my supply over time so that I don't have to deal with engorgement. This way will be a little less uncomfortable. I would've loved the opportunity to breastfeed Carleigh because it's such a wonderful bonding experience between mother and child and I loved doing it with Kyndra. Anthony and I went to the funeral home this morning to finish going over a few things with Brian and so that I could dress Carleigh in her burial outfit. We looked over the obituary and memorial card to make sure everything was ok. We also looked at the rough draft of what will be on Carleigh's marker and it looked good. Anthony's dad and brother weren't there yet so we took some time and just held Carleigh. She was very cold from the embalming fluid and her nose kept running so we had to keep tissues handy to wipe her little nose. They had her in her casket and she looked so tiny in it. It made me tear up just seeing her in there. I was so glad to see her because I missed her very much. We left her with her fuzzy pink blanket so we held her in that so we wouldn't have to feel her so cold. Once his dad and brother arrived we got everything ready to change her clothes. I took my time changing her because I wanted to savor being with my daughter. Her outfit looks very adorable on her. A little big but it still looks good. I put her jewelry on her too. After she was all dressed I put her back in her casket and covered her up with the blanket Anthony's grandma made. I made sure I gave her lots of kisses before we left. I am at home now and I am struggling. I miss my little girl so, so much. After we got the ok to leave from Dr. F my nurse, Michaella, got everything ready. Meanwhile, I dressed Carleigh in a different outfit to go to the funeral home. It starting getting to me at this point because I knew very soon she would no longer be in my arms. I was crying after I got her all dressed. She even looked so precious in her all white outfit. I wrapped her up in her fuzzy pink blanket and Michaella escorted us all out. Anthony went and got the van and our parents helped load all of our stuff up. It was just Michaella and I in the atrium and we both started to cry. I hugged and thanked her and went out to the van. The drive to the funeral home was too short. We took her in, along with our parents, to one of the funeral directors, Craig. We sat down for a little bit and spent a little more time with her. I couldn't stop crying. 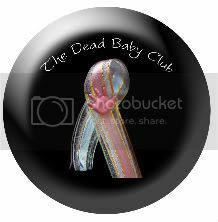 We set up to meet with them tomorrow for some last minute things and I will also be dressing Carleigh in her burial outfit. Finally, I had to hand my precious baby over to Craig. That was so very hard. I broke down. I know she is no longer in her body but I miss her so much. My arms feel so empty. My tummy no longer feels her little kicks. My heart is truly broken. I am very anxious to see her again tomorrow and to hold her close. Right now we are just spending some time with Carleigh. We have some family that are with us too. I will probably post in a few days our birth story. I know I want to get it down before the little details of it fades. Carleigh is 3 lbs 15 oz and 13 1/2 inches long. She's a tiny little girl but she has a big hold on her mommy's heart! I had wished very much that Carleigh would be born alive and that we could spend some time with her that way but I am not heartbroken that she was born still. When it came right down to it, it just didn't matter. Between Ashley, Kim, my father-in-law, and myself we will have lots of pictures. 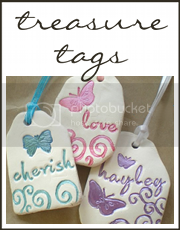 We also made sure to get lots of keepsakes. We have imprints of her hands and feet and also her hand and footprints. Just this afternoon we clipped some of her hair to keep. Yes, she has hair! I think she looks very much like her sister Kyndra, especially those precious chubby cheeks! I love holding her in my arms and just being close to her. I imagine we will be here in the hospital until sometime tomorrow. I plan on keeping her until we leave. At that time, we will call our funeral director and we will go with him to the funeral home. That is the part I am not looking forward to at all. It is going to be so hard. Carleigh McKenna was stillborn at 3:49 am this morning. She weighs 3 lbs 15 oz. She's already had her first bath and has her outfit on. We've gotten hand and footprints. Now we are just spending a little time with her. I have woken up so I thought I'd write. My epidural seems to be concentrated more on my left side. My left leg is completely dead. It was quite comical trying to change the pad underneath me. I just had to laugh. I have some ice chips because my throat is kinda dry. Anthony and Ashley are sleeping in my room and the rest of the family is spread out among a few waiting rooms. Some are awake and some are sleeping. I'm surprised that everyone has stuck around. I thought a few were going to leave and then come back. What troopers. I don't feel Carleigh kicking as much but that could be because of the epidural. She's been checked twice on the doppler and her heart rate is in the 140's. She had me worried when I checked it myself the first time because it took me awhile to find it. I am starting to feel contractions more on my right side. If they get stronger Erin will have the anesthesiologist come and check to see if she can help fix that. Right now it's not too bothersome. It's funny how things can be so different from labor to labor. Epidural is in and I feel much better. No problems with it going in and I don't feel a thing. My BP got a little low for a few minutes and I got nauseous and threw up some spit pretty much. Once I threw up I felt better though. Just lying in bed now getting ready to sleep. It hit me how tired I was once I couldn't feel any more contractions. Hopefully when I wake up I will be close to having Carleigh. We'll see I guess! Dr. F has stopped in for another check-in. She checked my cervix and I am 2-3 cm dilated and 80% effaced. So we are making progress! She checked Carleigh's position on the ultrasound and she is still where she needs to be. Contractions are getting stronger and more uncomfortable. I will probably end up with an epidural at some point simply because I know how beneficial it was during Kyndra's labor to help relax me and dilate my cervix quicker. On another note, I seem to be staying pretty calm and in check today, which has actually surprised me. I thought maybe I'd be more emotional but I'm not. Perhaps that is God working and all the prayers from so many people. The contractions are starting to get a little more painful. I'm a 1-2 on a pain scale of 10 right now and I'm sure that number will steadily increase over time. Pray that Carleigh tolerates labor well and she makes it through everything ok! 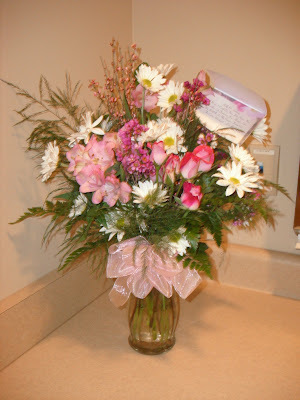 Thanks to Rachel and Cathie for sending me flowers to let me know you were thinking about me. They are pretty and smell wonderful! Rachel sent me the pink one and Cathie the other one. Monica's shift has ended and now my nurse is Erin. I asked Erin for another popsicle and she gladly obliged. Cherry too! I feel less hungry now thank goodness. It feels like contractions are starting to pick up a little so that is a good sign. Monica just increased my Pit to 39 mL/hr but before that I was walking the hallways for a little bit. I went through 3 walking partners. I really hope that helped to dilate my cervix. I felt some pressure down there while walking but not much with contractions. Maybe that's because I was just walking. I dunno. I'm going to try and get a nap here in a little bit before contractions get to where I won't be able to. It's supper time and I know it and that makes me hungry. It's hard not to think about all the things I'd like to be eating right now. A double cheeseburger from Burger King sounds quite tasty right now. That's the thing I hate about labor and delivery-they starve you! Ugggh!! My Pit is up to 27 mL/hr and at the moment I'm still not feeling pain with contractions. It's more "uncomfortable" than anything else when I get one. I finally finished reading the last book of the Twilight series-Breaking Dawn. (Good books by the way.) I had Monica put me on the heart monitor for Carleigh for a little bit and everything was sounding good. Dr. F stopped by and checked on me. She checked my lungs and also Carleigh's position via ultrasound. Carleigh is head down and in a good position. No cervix check yet. Dr. F thinks that the contractions aren't hard enough to really be doing much yet. So they'll just keep pumping up the Pit. My Pit has been bumped up twice and I am up to 12 mL/hr and the contractions still aren't that bad but they are getting a little stronger. I'm still up and moving about when I like and still pleasant to be around (in my opinion). I feel like no progress is being made but that may just be me. They havent checked my cervix since this morning so I don't know if I'm dilated any further. Dr. F should be in soon to check on me. Everyone's eating lunch and I got a cherry popsicle. I was very grateful for that popsicle. Kyndra has been mostly out of the room as she wants to grab everything I'm hooked up to. Poor girl, because she really wants her mommy. But there's lots of people to keep her occupied. She took a nap this morning so I was able to hold her then. Not too much action right now to report. I was having quite a few contractions together-not bothersome-so Monica backed down the Pit. Things settled down so she bumped it back up. Contractions have increased but aren't really bothering me right now. More family has arrived. I am in the hospital and everything is filled out. IV is in and Pitocin is running. I'm already having some contractions. Lots of family here along with Pastor Mark and Pastor Mike. Anthony just went to go get everyone to come back into the room and we're going to pray. Everyone is being so nice and accommodating. The cafeteria is making homemade banana and blueberry muffins for my family and they already brought up some drinks. My nurses are Emily and Monica and I'm sure they'll be great. Well, today is the big day-the induction. Been up since 5:30 am. Currently eating some waffles (3 to be exact because I know they will take away my food) and milk. Kyndra is being very clingy to me this morning, as she has been the past few days. I wonder if she senses that something is up. She's only calm right now because she's eating waffles too. I'm still doing ok this morning, probably because I still have to finish packing the hospital bag and get ready. So my mind is a little elsewhere right now. I think what has helped this week is reading books. I only have a couple chapters left on the Twilight series and I had wanted to finish it last night but Kyndra was only wanting me so I couldn't. I'll take my book to finish it off at the hospital. Thank you, Lord, for my husband who has stood by my side in everything. Thank you, Lord, for my daughter who is a constant joy to me. Thank you, Lord, for the many blessings you have given my family whether we recognize them or not. Thank you, Lord, for family and friends who show unwavering support. Thank you, Lord, for those that know that this journey isn't about anyone or anything else but our precious baby. Thank you, Lord, for hard times for it is through these times that Your glory is revealed. Thank you, Lord, for sending me such a special child to love and care for. Here are a few more pictures from our prayer shower on March 14. These pictures were taken by Anthony's dad. A few thank yous to those who have gave us gifts. 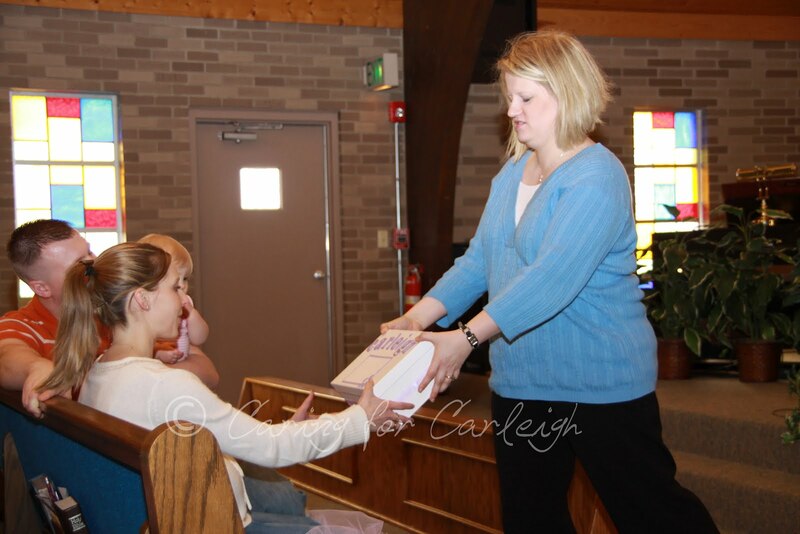 To Denise and Autumn for the photo album engraved with Carleigh's name. To Jessica and her family for the heart photo frame. 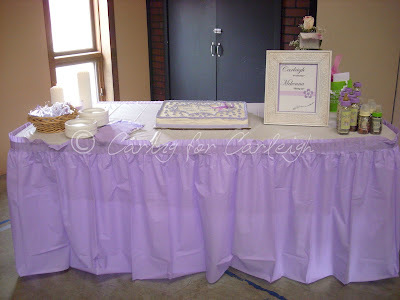 To Pi and her family for the photo frame that can be personalized with Carleigh's stats. To Rachel for the gift card to get a necklace with Carleigh's hand and footprints. To Sharon for the willow tree figurine of a mother and her baby. 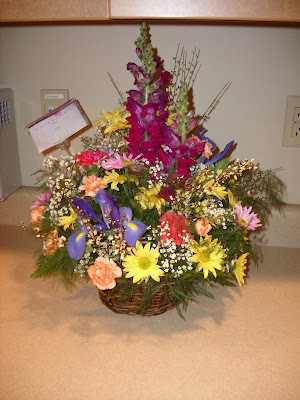 Last night Anthony and I met with Brian from the funeral home to finishing making all the arrangements. We first went over the obituary. Brian had a draft all printed up and we looked over it to see if there were any changes that needed to be made. 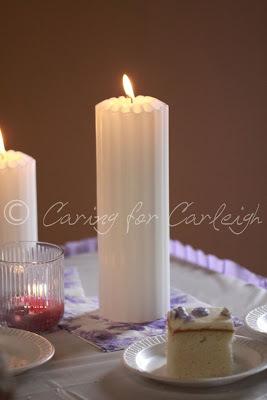 We did the same for Carleigh's memorial card. I still have to pick out a poem or saying to go in the card. 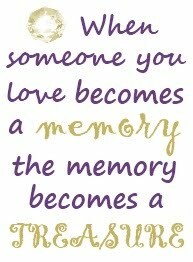 I have to do that today, along with picking out one for her marker, and email it to Brian. 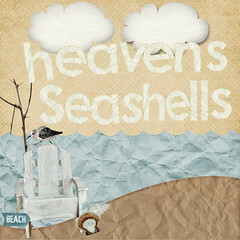 There were only a few changes to be made but also some things are still up in the air like dates to put and such. I also need to give Brian the info to where we'd like memorials to go (instead of people getting flowers). Brian had Carleigh's casket out so we could see it. It was very pretty. I already know she'll look very angelic in it. We had already picked out Carleigh's marker but Brian didn't have the info down so we went over that again and we picked out a vase to go beside the marker so we can put flowers in it. The cemetery won't allow flowers on the ground, except for around Memorial Day. So you can either have a vase to put it in or put it directly on the marker and I don't want to scratch the marker at all. It'll take about 6-8 weeks for the marker to arrive. I hope it turns out good and we like it. We talked about the possibility of Anthony and I taking her to the funeral home instead of having them pick her up. We'll have to see what the hospital's policy is on that when we go in. I told Brian that I would like to dress her in her burial outfit when it is time and I should be able to do so. We picked the times for the visitation and the funeral. Now I just need to finalize the actual service with Pastor Mark. I'll have to pick out some things for that this week. On a lighter note, Carleigh had the hiccups 3 times yesterday (at least that I could feel!). She's definitely getting them more often and I hope that is a good sign for her lungs. Also, one day Kyndra was lying on my tummy and both her and Carleigh had the hiccups at the same time. It was so cute! Today I had my final OB appointment before meeting Carleigh. Kyndra and I got there a little early but we had to wait a little bit because they forgot to tell Dr. F she had an earlier appointment. No big deal. I was off work today because Kyndra had a fever of 103 last night but she is feeling much better today. My BP was good at 88/58 and I am still at 120.5 lbs. My fundal height is still at 29 cm too. Carleigh's heart was pumping strong at 131 bpm. Dr. F went over the ultrasound report and we talked about that for a few minutes and then I mentioned to her getting induced on Friday. So we talked about all the options with that and a few things about my birth plan. She called Mother Baby Care to make sure that there were slots open for me to get induced. So we are set to go in on Friday at 7:30 am. Wow! That's only a few days away and that's so hard to believe. I still haven't packed my hospital bag yet. I'll try and get that done sometime this week, perhaps today. So, to all of those following our journey I will be posting updates as often as I can on Friday to keep everyone up to date on the progress. Saturday I had my belly casting party. It was a pretty good turnout. My mom and Anthony's mom were there, along with my sister-in-laws, Chantel and Taylor. 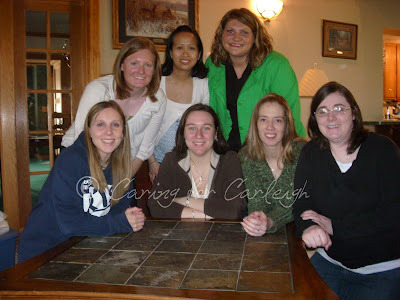 I also had some friends there from high school-Rachel, Jessica (also my cousin), Pi, Katie, Denise, and Autumn. I had a little bit of food out to snack on. We had cocktail wieners, pineapple, strawberries, and watermelon. Seems like a weird combination but it was good! The belly casting started out by draping some plastic and then a sheet over the couch to avoid any spillage of the casting materials. Chantel helped me wrap saran wrap over my pants and bra. (I did buy the bra to just wear for the casting but it was so comfy I wanted to keep it so I decided that should be wrapped too.) I applied the jelly that was supplied on my belly to help keep the cast from sticking to me but in retrospect I didn't put enough on because it still stuck to me and it wasn't real pleasant coming off. I then parked myself on the couch and the casting began!! After all the strips were on the plaster was applied to help smooth it out. The belly cast turned out really well thanks to everyone's help. The only thing left to do is sand it down a little once it is completely dry and then put a primer on it and paint it with a design and put on a ribbon to hang it. Chantel helping me get the saran wrap on. Autumn applying a strip of the cast. Taylor smoothing a strip down. Chantel and Rachel applying the layer of plaster. Me applying plaster to the inside of the cast. My ultrasound is done and it went ok. Little Carleigh is head down still and she had her spine pointing up so Beth couldn't get any good pictures of her face. This is the first time she was flipped that way so it was interesting! My fluid levels are good-they are around 20 (over 25 is considered poly). Beth took measurements of her femur length, humerus length, and abdominal circumference. Her femur and humerus are measuring around 35 weeks. Her abdominal circumference is measuring around 32 weeks. From the 3 measurements her estimated weight is about 4 lbs 13 oz (+/-13 oz), but we can't really be sure on the accuracy of this because no head measurements could be obtained but it's still nice to know. On the US report Dr. H mentioned that at my first US back in Sept Carleigh's CRL (crown-rump length) was measuring about 6 weeks and put my due date at April 24, but this measurement was likely wrong because of Carleigh's head, which would've measured shorter. He believes my due date is really April 17, which is what it originally was based on my LMP. I totally trust Dr. H and I believe he is right. It makes perfect sense now. So really I am 36 weeks today instead of 35 weeks. I did go back and talk to him about the due date and all of Carleigh's measurements while Lindsey and I were on our way to lunch. He said that her growth is lagging behind and it seemed he thought not waiting too long to have her was a good idea, which I agree with. (I had voiced my concern about her being stillborn.) He said he definitely wouldn't wait until May, which was the original plan based on the April 24 due date. I do plan on talking everything over with Dr. F on Monday (I moved my appointment from Thurs to Mon) but the plan is to go ahead with an induction next week. I would like to have it on Friday when I will turn 37 weeks (based on the April 17 due date) but I will need to check and make sure that all the slots aren't filled for that day. I'm hoping they are not. That's one of the reasons I moved my appointment up so that I would have a better chance of getting the day I want. It puts me a little more at ease knowing she will be considered "full-term" at the time I would like the induction to be. 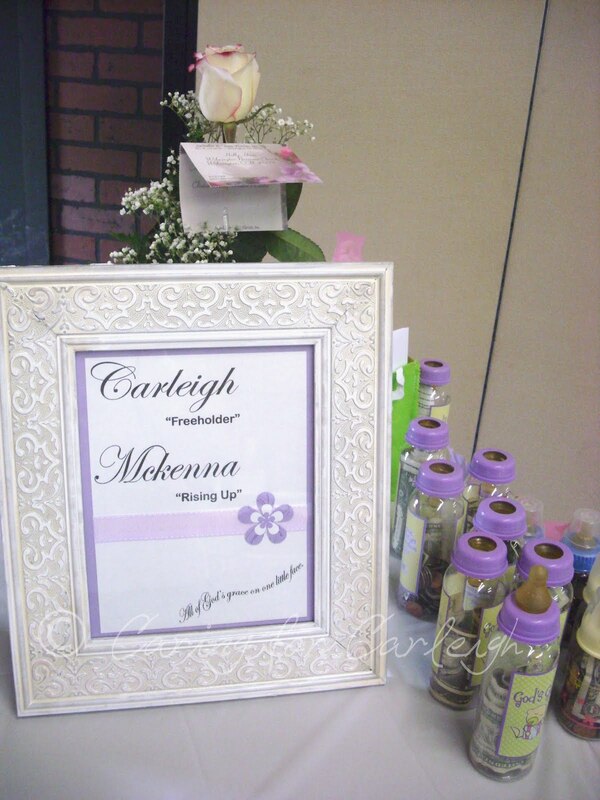 Looks like we will be meeting Carleigh very soon! I had another OB appointment today. My BP was 102/64 and my weight was 120.5 lbs so I am down 1/2 a lb from last week. Carleigh's heart rate was 148 bpm and she even decided to kick the doppler for fun. What a spunky lil girl! I am displeased to say that I have fallen even further behind on my growth. I turn 35 weeks tomorrow and my fundal height is measuring around 29cm. Thus, I am 6 weeks behind, which is even further than my last appointment. This really worries me. Dr. F left it up to me whether I wanted to get an US. I, of course, want one and it is scheduled for tomorrow at 10am. Dr. F and I discussed all the options. 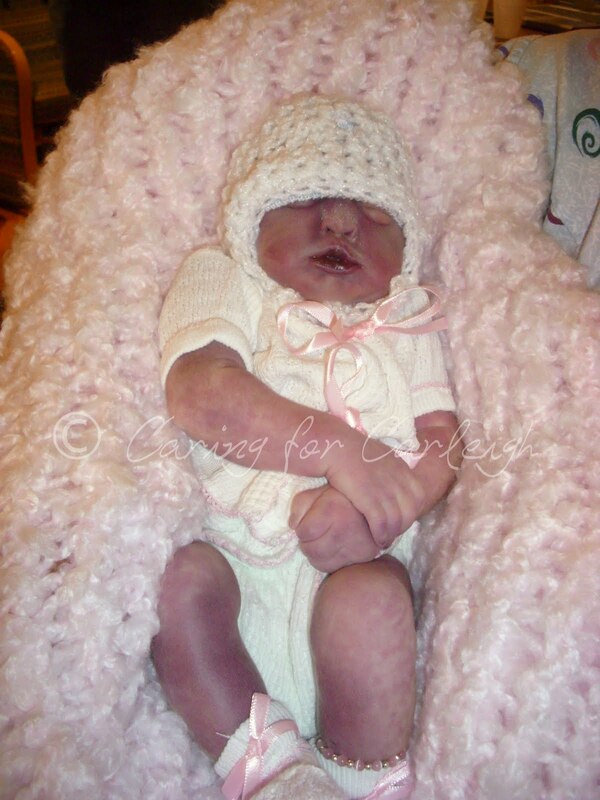 It is looking like Carleigh has IUGR (Intrauterine Growth Restriction) and that is not good. Having IUGR increases Carleigh's chances of being stillborn and that is something I do not want at all. So it is very likely that I will not be going to my due date like I had wanted. I guess it all depends on how tomorrow's US goes. If she is significantly behind on her growth then it may be time for her to come out. They will only be able to measure her femur length and abdominal circumference so that will all we have to go by. I have an appointment set up next week to go back to Dr. Fauley. She plans on doing the Strep B and checking my cervix. Please pray for Carleigh's US tomorrow. I am hoping that her growth isn't as far behind as my belly is but in all honesty I am not that optimistic. It's not good for her to be farther than 3 weeks behind and the last time I had an US tech check her growth (not scheduled) she was around 3 weeks behind. PRAY HARD!!! I am wearing a pair of shoes. They are ugly shoes. Uncomfortable shoes. I hate my shoes. Each day I wear them, and each day I wish I had another pair. Some days my shoes hurt so bad that I do not think I can take another step. Yet, I continue to wear them. I get funny looks wearing these shoes. They are looks of sympathy. 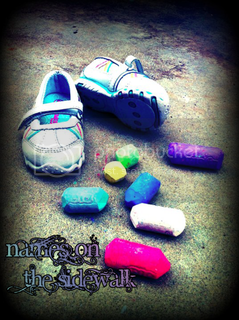 I can tell in others eyes that they are glad they are my shoes and not theirs. They never talk about my shoes. To learn how awful my shoes are might make them uncomfortable. To truly understand these shoes you must walk in them. But, once you put them on, you can never take them off. I now realize that I am not the only one who wears these shoes. There are many pairs in this world. Some women are like me and ache daily as they try and walk in them. Some have learned how to walk in them so they don’t hurt quite as much. Some have worn the shoes so long that days will go by before they think about how much they hurt. No woman deserves to wear these shoes. Yet, because of these shoes I am a stronger woman. These shoes have given me the strength to face anything. They have made me who I am. 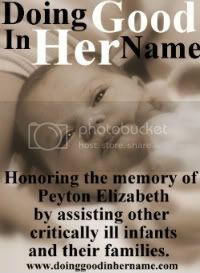 I will forever walk in the shoes of a woman who has lost a child. Instead of complaining, be thankful!!! There are so many things in our lives to be thankful for. Why don't we take the time to appreciate that which we have been given? Instead so many tend to focus on and complain about the things that we don't like or seem to go wrong. You can bet if you look hard enough you can always find something to complain about. Why do that? Why not focus instead on all the blessings? Take pregnancy, for instance. There can be quite a bit to complain about since there are so many changes going on with a woman's body. I belong to a due date group for Carleigh and you can hear quite a few complaints in the group. Everyone is getting closer to their due dates and getting more and more uncomfortable and miserable. Everyone's pretty much ready for their baby to come out already! I'm not trying to put anyone down by any means! I did my fair share of complaining with Kyndra and with Carleigh. However, the things that seemed so "bad" suddenly seemed so insignificant when we found out about Carleigh's anencephaly. Give me the terrible heartburn if my daughter could be healed. Give me all your stretch marks-just let my baby live. Give me all your aches and pains and contractions. I will gladly take it all if only I could spend just a day, a week, a month with my child safe in my arms. My perspective has totally changed-not with just my pregnancy but with many things in life. I've taken a lot of things for granted, believe me, but Carleigh has changed that quite a bit. I look at Kyndra in a whole new light. She is a precious gem and I actually cherish her more than before if that is possible! Life is so precious and fragile and we never know when it will be taken away from us. It's not just pregnancy I look at differently-it's life itself and everything in and about it. I have been forever changed by this experience and I will never be who I once was before this journey. I believe I am a better and stronger person. My faith has been tested yet I have not wavered. I have been blessed with a very special daughter. I was hand-picked by God to carry this child and only He knows the reason why. Why me? Is it because He knew I would accept her despite her anomaly and regardless of whatever anyone else thought or said? Is it because He knew I would love her unconditionally? Perhaps it is all of these and even more. I try not to think about what the near future holds for us. I try and treasure the moments we currently have with Carleigh but it is hard not to think about. I get so excited over every little thing she does. Her little acrobatics bring me much pleasure. Her hiccups excite me beyond words. When I see her on the ultrasound screen I can't help but smile. I know that at any moment she could be taken away from us and that is something I am not ready for. I want her with me as long as possible-both in my belly and in my arms. I guess what I really want to say is don't worry so much about things that don't really matter. Be thankful for what God has blessed you with. You truly don't know how good you have it until you're close to losing it all. If you want to participate in this please click on the button above! This blogger will feature your blog on her site if you are picked and will help bring more visitors to your page! In other words, a way to get your story out there more to others! I'm participating to try and get Carleigh's story heard even more! Check it out!! 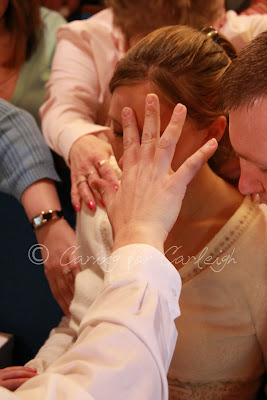 Our prayer shower was today and it was amazing! First of all, a BIG thank you to Holly, our Pastor's wife, who did a wonderful job of putting it all together! I know she had help from various people but she's the brain child of the whole thing. 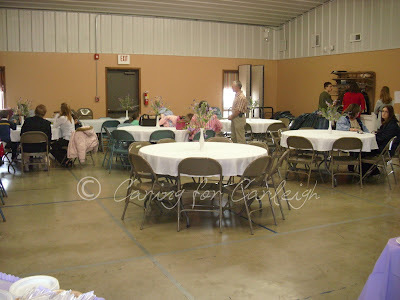 We started off in the Family Life Center of our church where we had lunch. We had a pretty great spread too! I'm not sure of all who made food but thanks! I had a hot dog because I haven't had one in awhile and it sounded good. The punch was good too! So everyone ate and socialized and that was fun. A lot of our family was there and that was great to see. I was glad to see some of our church family there too. 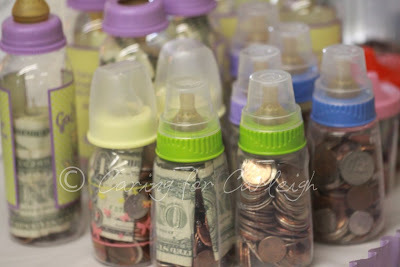 One of the things we did for the shower was that people brought baby bottles filled with money (bills or change) that would later be donated to the Clinton County Women's Center. Everyone did great in this and we were able to collect approximately $457 for the center. Holly let everyone know who attended the shower what the center does for women in the area and that this was a cause that is very close to my heart. I know Holly let the ladies of the center know about my shower but I don't think they were able to make it but they did send a rose and a card to the shower to let us know they were thinking of us at that time. It was nice! A little bit after everyone had finished eating we made our way over to the sanctuary of our church for the prayer part of the shower. 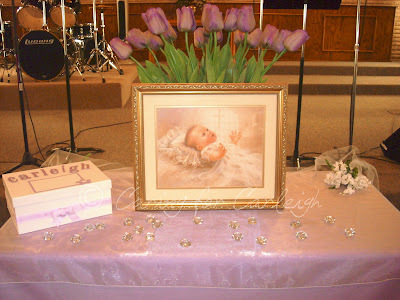 At the front of the church they had a table with lavender tulips and a baby picture. There was also a box off to the side that had Carleigh's name on it. 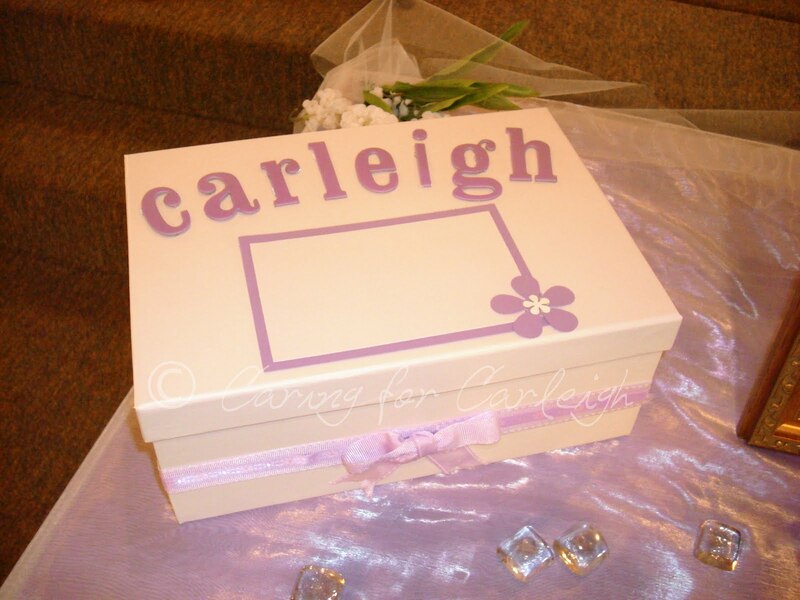 The front of the box has a space where we can put a photo of Carleigh. In the box are letters and prayers from many family and friends of ours. We have read some but not all yet and they are very thoughtful and touching and we truly appreciate the time everyone took to write to us. The service started out with prayer (of course). 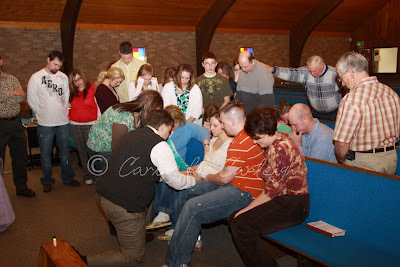 Pastor Mark prayed over Anthony, Kyndra, and I while everyone else was gathered around us. We then viewed a slideshow on the projector screen of photos of Anthony and I growing up. There were also pictures of Kyndra, Carleigh's 3D ultrasound photos, and photos from our maternity session. It was set to music-Beyond Measure by Jeremy Camp. It was really neat to see. Next the song Hope Now by Addison Road was played and the words were on the screen to read. After the song was over Pastor Mark annointed Carleigh and prayed. Another song, I Still Believe by Jeremy Camp, was played and the words again were on the screen. Next Pastor Mark prayed over our families. He was on one side and Holly was on the other while he prayed. We all sang Great Is Thy Faithfulness in closing. 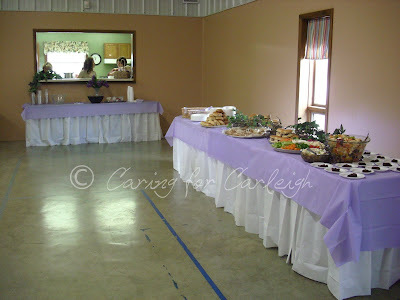 Then we all went back out to the Family Life Center for cake. 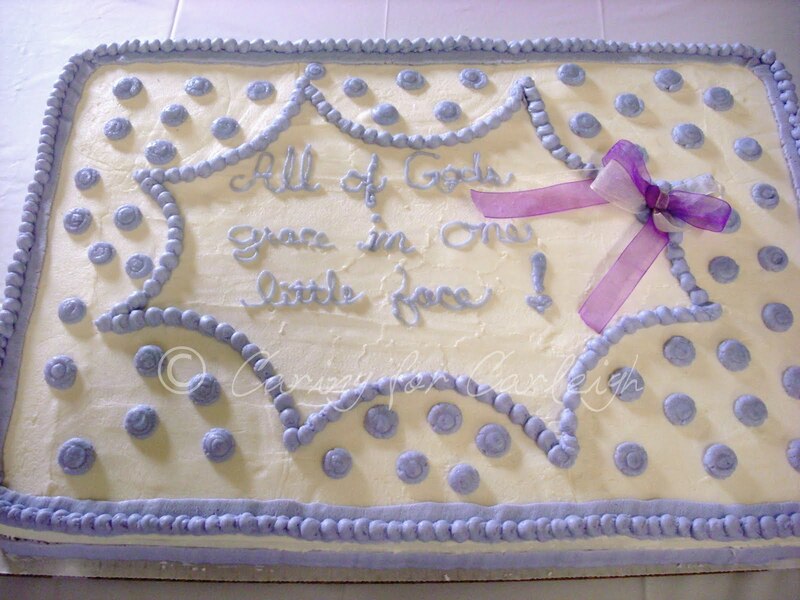 The cake was made by Angie, who goes to our church. The cake was so good! I loved the frosting! 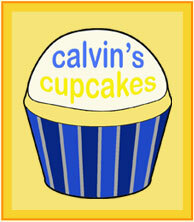 I think Angie should go into the cake-making business because I would go to her for all of our cakes for sure! I really loved the saying on the cake. It said "All of God's grace in one little face." Holly found the little saying online and I think it is just perfect! After cake everyone just socialized some more and slowly made their way out and back home. Thank you to everyone who attended and also to those who prayed for us even though they couldn't be there. Thank you to everyone who wrote to us for the box. I'm sure I will post some more pictures in another post since Anthony's Dad took more pictures than I did. I only took the ones I already have up but I'd love to share some more. We have received a few more gifts lately. My friends Tara (TaraKay) and Rebecca (MylifeMylove23) from Cafemom got me a couple baby books from A Place To Remember. I told Tara I couldn't decide between a couple of them since I couldn't look through them and see them personally and I had planned to get them both and then decide but they offered to get them for me, which I really appreciate! I decided to go with the one with the light blue cover so now I just need to get the memorial book to go with it. The other book I will offer to the ladies in my ABFA group. Thank you ladies!!! Melinda, who goes to my church, made a couple hats. One is for Kyndra and one is for Carleigh. I think you can figure out which hat goes to who. They are very cute! Thank you!! Anthony's Grandma crocheted a blanket for Carleigh. I had told her that I didn't have one that would be buried with her so she asked what I wanted and I said a blanket that was white and lavender and not too big. The blanket is just perfect and she did a wonderful job! Thank you Grandma!! Anthony's Mom bought Carleigh a cross necklace from Von's and also rings for Kyndra and Carleigh from there. The necklace is gold with a small diamond in the middle. Kyndra's ring is solid gold and Carleigh's has a design around the edge. It's hard to see in the picture the exact designs because since it is so close up you can't see a lot of detail. Thanks Mom!!! I have a few gifts I received recently so here they are! My sister-in-law, Chantel, and her husband, Rob, and their family got us a plain white outfit with a gold cross on the hat. It velcros together instead of snapping and is pretty neat! I think this would be the perfect outfit for Carleigh to be in when she leaves us and goes to the funeral home (but before we put her in her burial outfit). They also got Carleigh and I matching pearl bracelets. 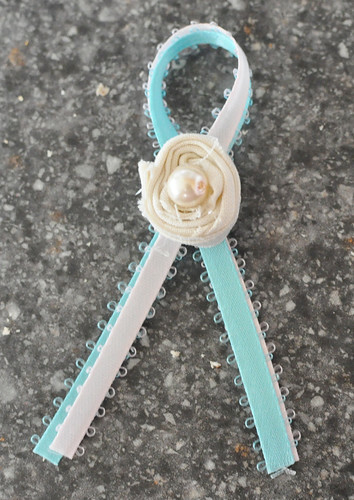 They are very pretty and so dainty and girly! Thank you!! I also received in the mail today a handmade blanket from Megan (meg1129) from Cafemom. It's so beautiful and wonderfully made! The color is so rich and I love the shade of pink. The bows make it extra cute! Thank you! !